five − 5 = Required Please enter the correct value. What we learned from the FOMC's March 15-16 meeting minutes is that policymakers are divided when it comes to the pace of hiking Federal Reserve interest rates and the health of the global economy. Some are calling for an April hike, while others are leaning toward a more prudent approach. When Will the Next Fed Interest Rate Hike Happen? Is Another Fed Interest Rate Hike Coming in 2016? When Will the Next Fed Interest Rate Hike Happen in 2016? Who’s Ready for the Fed to Chicken Out This Week? Will the Fed Raise Rates at Its December Meeting? After another dovish Federal Reserve interest rate statement from Chair Janet Yellen yesterday, global stocks and commodities are rallying. Investors can now expect lower interest rates to last deeper into 2016. The March FOMC meeting concludes today when the U.S. Federal Reserve releases its policy decision. Now the focus shifts to what the decisions from the FOMC meeting today mean for investors and their money. Big banks around the world are secretly rooting for another U.S. Federal Reserve interest rate hike this week. That's because every Federal Reserve interest rate hike causes an immediate spike in their income. Last year the U.S. Federal Reserve paid out $6.9 billion to the Big Banks, including more than $100 million to Goldman Sachs Group Inc. (NYSE: GS) and more than $900 million to JPMorgan Chase &amp; Co. (NYSE: JPM). The U.S. Federal Reserve kicked off its two-day policy meeting Tuesday, and investors are looking for any sign of the next Fed interest rate hike. The overwhelming consensus now is that we won't see a Fed interest rate hike at the conclusion of the U.S. central bank's meeting on Wednesday. The Fed interest rate hike in December was the first rate increase for the U.S. Federal Reserve in nearly a decade. But now the focus has shifted to whether another Fed interest rate hike is coming in 2016. Projections from policymakers show they will continue to raise their target range by a full percentage point during 2016. That would leave rates at a range of 1.25% to 1.5%. After the first Fed interest rate hike on Dec. 16 (Wednesday), investors are anxious to know when the next rate hike will be. Wednesday's quarter-percentage point (0.25%) Fed interest rate hike was the first since June 2006. The Fed's vote to raise rates was unanimous, signaling its increased confidence in the U.S. economy. Wall Street and the media breathlessly waited for Yellen & Co. to hike the fed funds target from 0% to 0.25% up to 0.25% to 0.50% - a move that's been telegraphed for months and largely already priced in to the ZIRP-addled markets. The drama around this move was manufactured. You can't call those rates anything but accommodative. But with so much focus on the fed funds rate, it's really not surprising that the media missed the fact that the really important rates have been on the move since July. Meanwhile, "overnight money," money that the central bank loans overnight to banks (and which the Fed influences through open market operations), has barely budged. If the December Fed rate hike of 0.25% marks the beginning of a period of tightening, the U.S. taxpayer is about to get a very unwelcome surprise. Now that the U.S. Federal Reserve is raising interest rates, it won't be so easy to hide the dire consequences of years of loose money policies - especially all the quantitative easing (QE). The long-awaited December Fed rate hike finally happened - so what will it mean for stocks? You'll hear a lot of talk today about how raising interest rates will have a negative impact on companies. It will hurt those that borrowed a lot of money when interest rates were near 0% - as they are today. Fortunately, the December Fed rate hike is going to have a much more mild effect on stocks than the doomsayers would have you believe. The December Fed rate hike is finally here. After all the anticipation, the Fed increased its target rate by a quarter of a percentage point (0.25%). So how will it affect investors? The Fed's December rate hike move signaled its confidence in the U.S. economy. After reviewing its key economic indicators, including unemployment, inflation, and its measure of the global economy, the Fed was satisfied enough to raise rates. So far, Wednesday's decision hasn't panicked investors, as some doomsayers predicted. Will the stock market crash today following a December rate hike announcement from the U.S. Federal Reserve? 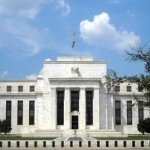 The Fed is expected to raise interest rates today (Wednesday) for the first time since June 2006. Today (Wednesday) marks the final day of a two-day Federal Open Market Committee (FOMC) meeting. Investors are speculating that the U.S. Federal Reserve will raise interest rates at its second FOMC meeting on Wednesday - the first rate hike since June 2006. This week, the U.S. Federal Reserve is the most powerful market-moving group on the planet. Pretty scary. For months everyone's been certain the Fed would raise rates in December. But frankly, it doesn't matter one whit whether it does so or not. Many financial analysts and economists think the Fed will raise interest rates at its December meeting. It would be the first rate hike since June 2006. For a rate hike to happen, the Fed must determine the economy has improved enough since the Great Recession. And the data the Fed pays attention to most show the economy has.